It was more than just a wall: it was a whole military zone designed to control movement across the northern frontier of the Roman province of Britannia. Great earthwork barriers survive, along with the remains of forts and temporary camps; watch-towers and fortified gates; civilian settlements, temples, cemeteries, bath-houses, roads and bridges. Stretching across the spine of England from the North-East coast to the Irish Sea, the line of the frontier extends for over 100 miles through every type of landscape: from the streets of urban Tyneside, through arable fields; along the crags of the wild Whin Sill; to the sands of the Solway, and down the coast of Cumbria. Drawing upon the extensive expertise and unrivalled archives of English Heritage, and those of its partners, this map depicts the fruits of modern archaeological research: in field survey, geophysics, excavation, and the analysis of aerial photographs. 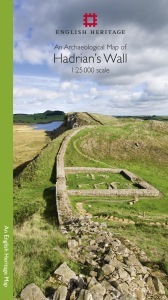 Using Ordnance Survey 1:25,000 data - the ideal scale for walkers - this revised new map shows with great clarity all the elements of Hadrian’s Wall, and distinguishes between those features that are visible and those that have been levelled through time. A brief text explains the remains on the ground, and how to use the map to find them – including the museums and the best places to visit. This World Heritage Site is now more accessible than ever before, so see the landscape through new eyes.